The rubber thongs are coming with us. If you read the last post you would have seen that we decided to leave the 650 grams of rubber thongs at home rather than lug them up the 1200 metres of climbing we have to do in the first two days of our trip. After finding out what other people were carrying around on their bikes, and pondering it for a few days, we became beastly careless about the weight. Having said that, the Captain is getting very edgy and wants to leave NOW before either of us thinks of something else we ‘need’ to take with us. 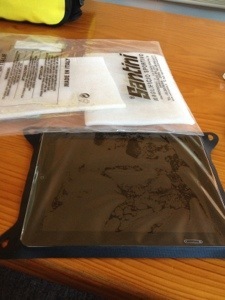 After much deliberation and weighing, the iPad is well wrapped up in its lightweight waterproof case, foam and plastic bag. Hopefully this will keep it safe throughout our hot, dry and possibly bumpy trip! There’s 600 metres of climbing coming up tomorrow from Hobart to Bothwell. We’ll see whether our rubber thongs are still with us when we get there! ← The Final Pack – Are we going to make it up those hills? Go guys! Have heaps of fun and enjoy the scenery. And don’t worry you will get plenty of rest time and fabulous food and coffee when you make your stop in Melbourne.